Our own series of presentations started tonight at Oakland's Cathedral of Christ the Light. No rain, no traffic jams, sold out audience. What more could we ask for for Christmas! It's been kind of epic since Christmas, if we remember back to when we had to drive from Connecticut to Michigan because of snow, various personnel changes, the very, very big National Youth Choral Festival and so much more. 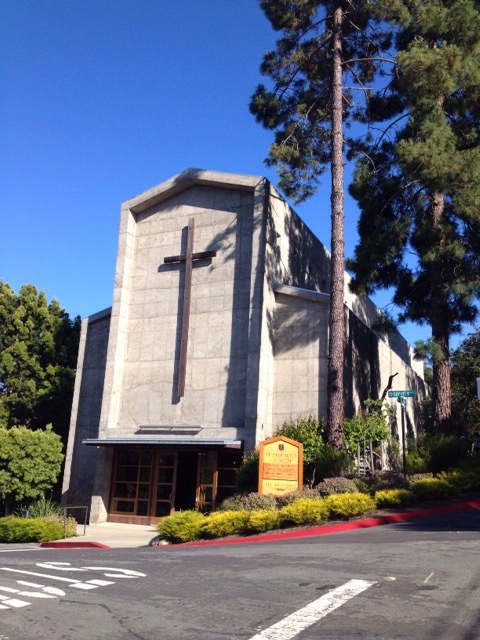 We've been taking Spanish Gold around the Bay Area to finish it all off - Mission Dolores, St, Francis in Sacramento and St. Stephens in Belvedere - the latter for the first time. Fred has been extremely impressed with the attentiveness and appreciation for Renaissance music of our Bay Area audiences. We've known this for 37 years, but it's all new to Fred and he's really awestruck. Before we take vacation–which is before we go to Europe in July–we're going to have the pleasure of recording a track on an album Leslie Ann Jones is producing at Skywalker Sound. Then, we'll see you in Austria. Thanks to everybody for all the support this season. Our 45 minute mainstage show at the birthday bash with guest artist Nellie McKay had a very jazzy flavor. Then there was the big Biebl with all our our alumni guests. 350 lovely people came to celebrate at the San Francisco Conservatory on Friday night. They were serenaded in by the Louis A. Botto (LAB) Choir which everybody appreciated, especially those who knew Louis and how pleased he would be about it. A few dozen former Chanticleer singers came; their presence was much appreciated as a symbol of the longevity of Chanticleer and its importance to the men who have been in it. The highlight of the evening probably was their joining us on stage to sing the Biebl Ave Maria, which we rehearsed at 44 Page before the evening started ( although if you've been in Chanticleer it's hard to forget it, there are actually singers who go back to before there was Biebl!) That was very moving to all - onstage and off. Our guest for the evening was jazz songstress Nellie McKay who joined us for our performance of jazz repertoire, starting with a Comedian Harmonists number called Freund ( sort of summing up our feelings about the fellowship we have.) The very versatile Nellie accompanied and sang from the piano in a few numbers, including Cole Porter's "Night and Day." She accompanied a quartet singing "She's nobody's sweetheart now" on the ukelele, and played the uke and sang in "Dedicated to you." That was fun. At a little VIP after party in "Memory Lane" which had been decorated with old posters, recollections by singers, and photographs, Nellie sang, and we toasted the first 35 years of Chanticleer. Last night, Saturday, we appeared at the top of Nellie's show at the Venetian Room - a legendary San Francisco jazz room, where we had never been.All in all, a great birthday. Now we'll rest up a bit and go back to doing what Chanticleer does in Oregon, Connecticut, Pennsylvania, Kentucky, Ohio, Indiana, Illinois, both Carolinas, and Georgia. Pretty exciting to have this recognition of our 35 year journey. We are preparing for the arrival of Nellie McKay on Wednesday which promises a couple of days of fun preparing for our joint appearances at our birthday party on Friday night at the San Francisco Conservatory ( sold out, but you can call and see about any turned back tickets if you like) and Saturday night at the Venetian Room (ditto, officially sold out, but no harm in calling.) A few dozen alums will be present on Friday night - including those who are now part of Clerestory, and we look forward to seeing them and taking some trips down Memory Lane.